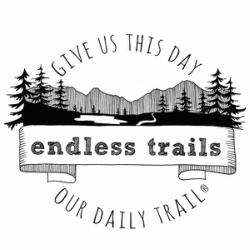 Endless Trails is a Northwest 501(c)3 non-profit committed to ensuring trails live far longer than any of us. Through trail work, education, collaboration, and advocacy, Endless Trails seeks to preserve today's wild spaces for generations of future explorers. We prefer to spend the majority of our days outside, traipsing trails, learning about our natural environments and how to best preserve them, and making sure our footprint is as small as possible. If you’ve found us here, there’s a good chance you feel similarly. In 2013 we launched Endless Trails alongside a perpetual, year-round commitment to keeping our beloved outdoor spaces sacred and serene. It's part of a life-long commitment to trails, and a commitment about which we're endlessly psyched. Who are we? We thought you'd never ask. You can also read more about our back-story, and the idea behind Endless Trails right here. Our board is comprised of fantastic, trail-loving humans, and you can meet them all right here. AS THEY DO WITH ANY NOBLE PROJECT GRAND IN SCHEME AND SCOPE, MANY HANDS MAKE LIGHT WORK. So here's where you come in: To continue making this dream of ours a sustainable reality, we'd love your help. In fact, we downright need your help. To join a scheduled trail work and/or clean-up day, and/or just add your name to be kept in the loop about future trail work opportunities, please click here. To learn more about how you might be able to donate your time and/or various resources, please hop on over here to read about giving and sponsorship opportunities. To make a tax-deductible donation to Endless Trails, please click here. Whether or not you decide to partner with Endless Trails, we hope you'll at least travel along with us here as we traipse some of our favorite trails, explore myriad new ones, work to advocate for hard-to-reach and less mainstream trail systems, and educate outdoor enthusiasts everywhere about trail sustainability and how to best preserve today's wild places for future generations of explorers. LOVING ON TRAILS SINCE 2013—WE HOPE YOU'LL JOIN US! We strive to update this site regularly with trail and trip reports, regular and annual updates, what we've been reading and learning, photography, gear [and beer] reviews, and the latest from our fantastic, outdoor-minded sponsors/partners. You can find our upcoming (and past) travel and project itinerary right here, and you can sign up for an upcoming trail work party right here. ​Want to run and/or volunteer at one of our trail races (which are also fundraisers for Endless Trails)? Awesome! More info on those can be found right here. Hope to see you on the trails with us soon! QUESTIONS? PARTNERSHIP IDEAS? VIRTUAL HIGH-FIVES?